Presents Volume 1 is a welcome addition to the growing catalogue of horror manga being made available in English. 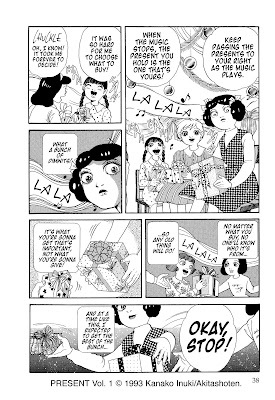 Presents and other series like it (such as Housui Yamazaki's short-lived Mail series and Junji Ito's Museum of Terror collections) are worthwhile in their own right, but they're even more notable because they fill a void in the American comic book market left by the collapse of titles such as Tales from the Crypt and House of Mystery — the lack of episodic horror comics involving some sort of narrator, host, or recurring character who makes sure to spell out the story's moral for the reader. Presents returns American comic readers to this formula familiar to those who grew up with the classic horror comics from EC, DC, and Warren. The book is really a collection of short stories, individual tales that all feature a mysterious young girl named Kurumi who bestows ironic gifts on unsuspecting (but not innocent) victims. As the copy on the book's back cover indicates, Kurumi's gifts are never what they appear to be, and they're never what the recipient wants. (Although frequently they're what the recipient deserves.) The stories are very formulaic — beyond the overall horror conventions already mentioned, the chapters in volume one all follow the same beats; and from the stories' setups, you can usually guess what the surprise twists will end up being. But that doesn't mean the stories aren't effective. After all, in most moralistic horror stories the ending will have a certain sense of inevitability in order be effective; what matters is how you arrive at that ending. And, in fact, the anticipation of knowing what is coming can heighten the sense of dread in a good horror story. Creator Kanako Inuki knows how to craft an engaging horror story, coming up with tales that linger with you long after you've read them. Sure, many of the stories are little more than comeuppance theater, and we're happy to see the rotten jerks get what's coming to them. But a number of the stories also touch on deeper issues revolving around the neglect and outright abuse of young children. (One particular tale involving a young girl ignored by her parents and caretaker is especially unsettling, perhaps in part because as a working parent I struggle with the guilt of not always being there for my children.) The final tale in the book (more of a fable than a horror story) even deals whimsically with the problem of Japan's declining birth rate. As noted above, this review is based on a photocopied preview sent by CMX, so I can't address the production standards of the finished book. Most of CMX's recent manga have been of high quality, though, so I expect that the binding and paper quality will be top-notch. Other factors (which I assume will remain unchanged in the published work) were all impressive: the lettering was clean and well laid out; the sound effects integrated well with the artwork and often reflected the qualities of the corresponding sounds in their appearance (for example, a chaotic and dusty-looking "RUMBLE"); and the translation was readable and natural-sounding. All in all, Presents is a pleasant surprise and a nice addition to CMX's growing stable of quality manga titles. If, like me, you miss those old horror comics you used to read when you were younger, Presents is the perfect gift to give yourself. Presents is currently available through online retailers such as Amazon and Barnes & Noble and will be available in comic shops this Wednesday, Oct. 10. UPDATE: PWCW has an 8-page preview available on their site. Dream Team Week Extra: Vote For Your Favorite!